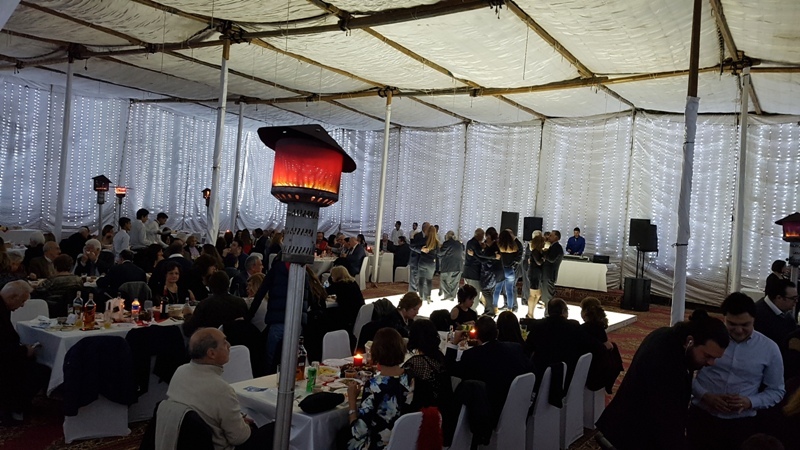 HMEM Nubar Cairo celebrated Khetoum on Friday 5th January 2018 in a stylish and elegant manner with around 200 persons attending the event in a gracious atmosphere in the elegantly tent-covered old Tennis court overlooking Salah Salem with a delectable food service and great music. Upon entering the stylishly decorated tent, the feeling of being in a place other than our favorite club soon takes over, giving the impression of being transported to another well-designed graceful unknown location where you still meet the familiar faces of your friends, club members and staff while enjoying the household customary friendly surroundings of our club, together with the good music, food and the flair of HMEM Nubar’s traditional Khetoum nights. The music was assumed by Alain Karkour who thanks to his songs’ variations was able to please all tastes. HMEM Nubar Cairo’s board and its Ladies Committee had once again done a wonderful job and were able to pull off a wonderful event with an innovated backdrop and settings. Before the end of the event, Mr. Garen Touloumbadjian, the vice-chairman of HMEM Nubar Cairo, on behalf of the Chairman and himself, rightfully thanked the Ladies committee, the board members and also Mike Nabil who all worked together to make this event a success. The night ended at around 3:00 am with the famous tombola presented by Mrs. Marlyne Avanian, all in good spirits whether for the regular winners or for the always-grudging losers after a fabulous night full of enjoyment and delight in which the dance floor was kept busy from start till end.